Messaging apps: The next frontier for publishers after social media? As messaging apps amass huge audiences and are on track to becoming the next big digital platform for news consumption, an increasing number of news and media publishers are turning to these apps to engage with new audiences. The report suggests that the news industry is beginning to see renewed consumer trust in established news brands over news in distributed platforms. Yet, the challenge for publishers is to determine how to connect with audiences as they continue their shift from open to closed platforms while developing value propositions that are financially viable. Clearly, messaging apps are where social media is going next, and we and other publishers need to figure them out. The Post’s chatbot on Viber automatically sends users the top headlines from five different news sections; Politics, National, World, Opinions, and Entertainment, within the app. Users can choose to receive news updates either daily or weekly. They can also opt for additional updates from their sections of interest. It includes a dashboard where users can subscribe to The Post, watch original video content, and invite friends to sign up for the chatbot. Giving our global audience access to quality, independent journalism is of huge importance to us. We’re proud to work with The Washington Post to create a bot that allows users to easily find, discover and personalize their news experience and receive the top daily or weekly news stories within their favorite app. The Post also offers news-related stickers within the app for readers to visually enhance their messages. They include colorful text of journalism catchphrases like “off the record,” and Washington Post-inspired graphics like the Pinocchio illustrations from the popular Fact Checker blog. The pack is available for free on Viber’s sticker market. 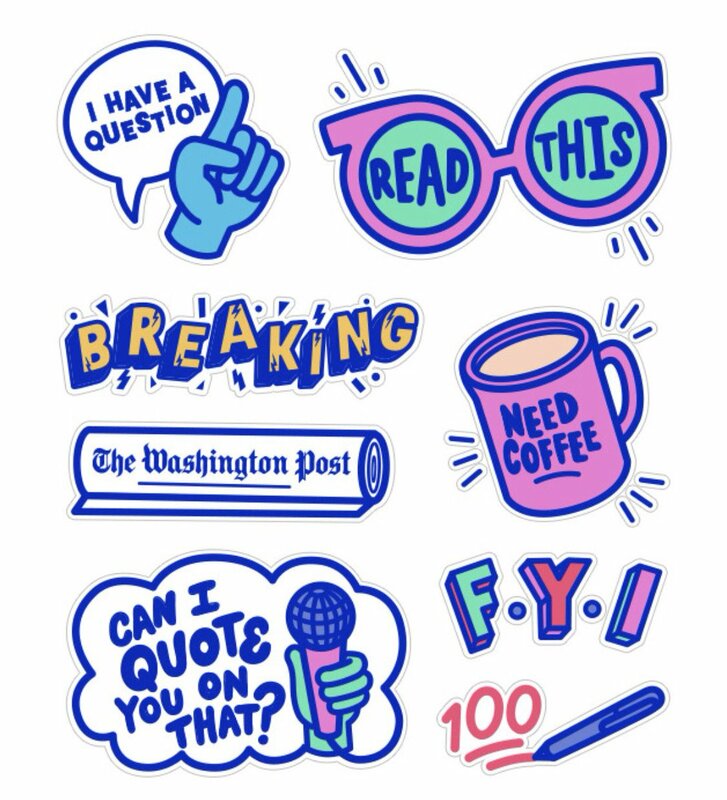 “The stickers we’ve created allow users to say what they want about news without having to type a complete thought and simply add delight and character to their conversations,” says Amy King, Design Director, Emerging News Products Team, The Washington Post. We’ve seen great potential to grow our audience internationally by allowing readers to access Post journalism on widely-used messaging apps like Viber, where they spend most of their time. With the platform’s massive global user base, we’ll continue to create interesting and fun ways to engage on this platform. The Post launched its first pack of stickers on Viber in 2016; since then, it has been downloaded more than two million times. The introduction of these features is a continuation of The Post’s innovation on other messaging apps. In 2017, the publisher had invited people to interact with its Berlin-based reporter Rick Noack via Whatsapp as he covered the German elections and later, the future of the European Union. While Viber is less popular than WhatsApp and Facebook Messenger, it has shown steady growth over the years and has over a billion users, which makes it one of the key players in the market. It is especially popular in Eastern Europe. A distinct advantage that Viber offers publishers over Whatsapp is the ease with which they can reach large numbers of people. WhatsApp has set a limit of 256 subscribers for each broadcast channel. When that limit is reached, the publisher has to create a new channel for additional subscribers. The more broadcast channels a publisher has, the more times they have to duplicate the publishing process across the multiple channels. So for a publisher to manually sign up a thousand people on WhatsApp may take up to five hours. But on Viber, an unlimited number of users can sign themselves up for a channel. While it takes three minutes to publish a piece of content on Viber, the same process could take up to half an hour on WhatsApp, primarily because of duplication of effort. Viber has a timeline feature as well, which makes it easy for subscribers to catch up if they come to the story after it has started publishing. There are significant advantages in the chat ecosystem for publishers. They include huge untapped audiences, high engagement through push notifications and unique products like chatbots and stickers. Plus there is the opportunity to build community through chat rooms and crowdsourced storytelling. There are so many messaging apps. It feels like you should be on all of them. Have a deep understanding of who your audience is and what their needs are. Make sure you’re in the space where your audience is already active. Spend some time listening to your audience, to hear what it is they need. You want to provide some utility and service on those apps.